After skipping a year, we returned to Kendal for the third Lakes Comic Art Festival. We rented the Marketplace Hideaway: hidden away indeed, to the extent that, when we arrived yesterday evening, after road closures leaving Barnard Castle, after a scenic drive through scenic Cumbria, with sun and clouds (mostly clouds) making patterns on the hillsides, after twice round Kendal's one way system, and braving signs saying "No Entry Except Deliveries", because we were delivering ourselves and our belongings, weren't we? - when, after all this, we identified our landmarks between which we would allegedly find our path, we still couldn't see it. Closer still, though, and all was as described, and we have a choice of bedrooms, a small but perfectly adequate kitchen, a bathroom and a downstairs lounge. (TripAdvisor has some photos.) There was no wifi - which is to say that if you stood outside in the garden, Kendal Wifi was intermittent, and durham_rambler connected with the Cloud, probably via Caffe Nero next door. So I wrote this a bit at a time over the weekend, and am uploading it now with (I hope) a minimum of editing - I'd rather put my time into adding pictures and links than fretting about tenses. By the time we'd tumbled into the house, and listened to the News Quiz and warmed up a bowl of soup, it was time to go out to our first event, a showing of Dave McKean's Luna featuring "an exclusive director's summary" - which meant, Dave McKean explained, that he was going to show us his film, but "I'm going to spoil it for you - I'm going to talk all over it." I wasn't sure this was a good idea, but in fact it worked really well, with not only the director's commentary but even questions from the audience. So, after McKean explained that rather than mock up a studio for his artist character, he had simply used his own studio, there was a shout of "Dave, are those youyr awards?" Yes, they were - he'd got them out of the box in the garage specially! Had we but world enough and time, I'd happily have watched Luna first, and then watched it again with commentary; as it is, I'd happily watch it again. Key quotation: "I happened to have a dead falcon in my studio..."
It's also a great extended advertisement for a holiday rental in Lee Bay on the north Devon coast. The Castle Dairy is the oldest building in Kendal. It's also a restaurant where students practice their skills before being unleashed on the world, but it's a cut above the (very agreeable) restaurant at Durham's New College. From the delicious sourdough bread to the authentically intense double expresso, we met high standards and attention to detail. My goat's cheese mousse starter was a startling composition in purple. The plate was dusted with a fine powder of walnuts: for once, part of the taste of the dish as well as the look. I'd have been happy with a more pronounced goaty tang: I know not everyone likes that taste, but mostly people who don't like it don't take the goats cheese option (I asked where the cheese came from; it was Irish). 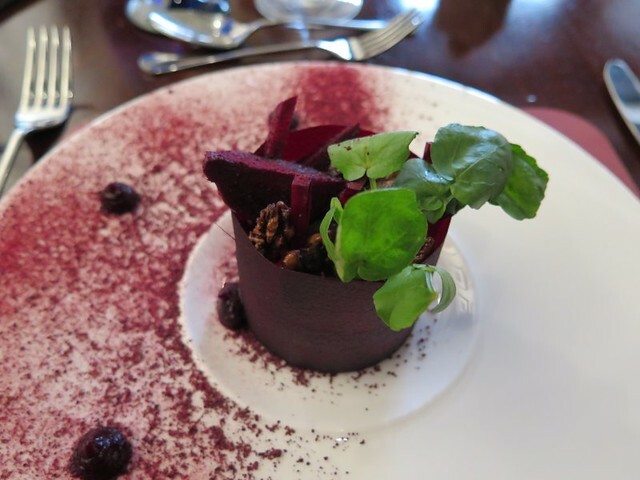 As it was, the mousse was creamy, and sweet with beetroot and candied walnuts: it could almost have been served as a dessert - and it was pretty enough, too. The main course was breast of Goosnargh duck: I should look up what this means, but it came as two chunky strips of meat, cooked to a tender pink throughout, almost the consistency of liver, grainless, melting. Vegetables included chicory cooked to an intense sweetness with orange, lyonnaise (I think) potatoes, something green, little dots of pureed carrots - all good, but lacking focus. 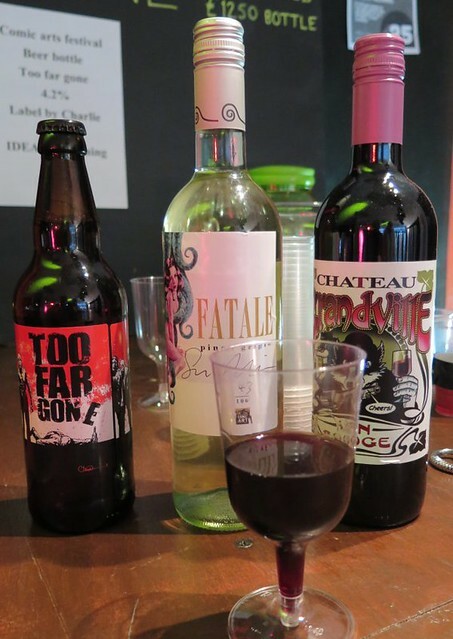 This is partly my fault, because the wine list had some interesting bottles at very reasonable mark-ups, and I chose the Telegramme (the second wine of Vieux telegraphe) and loved it: fruity, peppery, velvety, spicy. It was a perfect companion to the meat, and rather eclipsed the vegetables; but it made it easy to be virtuous and withstand the dessert options in favour of cheese (good cheeses, but again, not majoring on the local). As desperance says, good wine is better. Or was that me? desperance may have said something very similar about books. Both are true. From here it was a short step to the Kendal Museum, where Sean Phillips had assembled a collection of record covers by comics artists. There were some very well-known examples (Robert Crumb's cover for Big Brother and the Holding Company's Cheap Thrills , some samples of Dave McKean's work in this field) and some real surprises: a wonderful Moebius gatefold for what appeared to be a posthumous compilation of Jimi Hendrix material (ah, it's a French release, that makes sense, shown, fourth image down, here alongside some more wonderful Moebius images of Hendrix), a Robbie Williams album by Frank Quitely. The captions were informative about the life and portfolio of the artist, less so about the music, or about how the two came together: sometimes it's presumably just a matter of commercial artists doing commercial art (Rian Hughes, for example) but was Neal Adams a Groundhogs fan, or were the Groundhogs Neal Adams fans? I think we should be told. I'd anticipated that there'd be a divide as the wide open spaces of the 12 inch LP gave way to the jewel case of the CD, but I couldn't see it, and the attendants thought - without any certainty - that the artwork on show was all from vinyl records (which says something else about the recent examples). 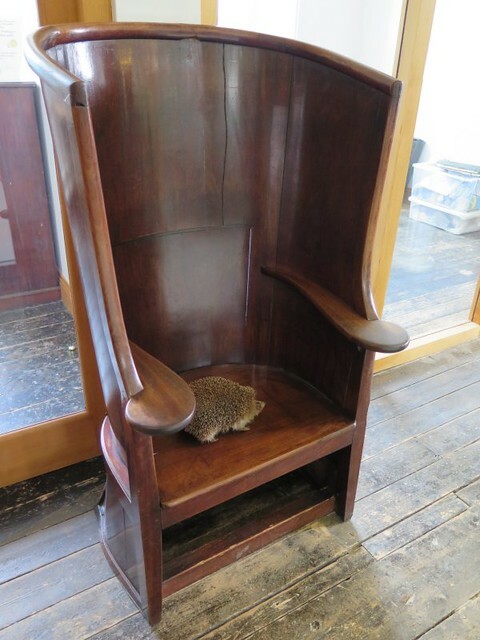 We didn't have time or energy for more than a superficial look round the museum's collection, but I liked this subtle way of indicating that the chair is to be admired, not to be sat on! In between, we spent the second evening in succession with Dave McKean. I had been taken by surprise by the live, informal nature of last night's film showing; now I was wrong-footed all over again by the formal, staged quality of 9 Lives , a sequence of songs and stories performed live by McKean and saxophonist Ian Ballamy. I had, I suppose, anticipated - and actually, this is what the programme offers - songs and stories accompanied by visuals; silly, because, with no disrespect to Dave McKean's talent as a songwriter and musician, the visuals were always likely to dominate. This was more like watching a series of short films, with live performers providing the soundtrack, the sort of experience I had expected the previous evening. The music was fine: I didn't bring much of it away with me, but I rarely do memorise music on a first hearing; I was braced for the free form and the jazzy, but while some of it was structurally quite loose (maybe not so much so as the music from Luna , which I loved), there were a number of songs, written as a result of a bunch of lapsed musicians deciding one evening in the pub that they should stop wingeing about how they wished they still wrote songs and, er, write some songs! The piece which worked least well for me was n[eon] , an early film: durham_rambler found it 'mesmeric', but I may have drifted off to sleep. Some images made me want to shout 'Stop!' so I could keep looking at them, which was frustrating, but not in a bad way. There was an offer on tickets if you booked for all three Dave McKean events, and I would happily have gone to this morning's session looking at his artwork - but it clashed with something else, because this is the sort of festival where there's a choice of things going on all the time. So instead, we started our Sunday morning with a live drawing session: Matthias Adolfsson from Sweden and Boulet (from France) sat on opposite sides of the stage, each at his own drawing table, with cameras picking up what they drew and projecting it onto a screen, while the presenter ran from one to the other, engaging them in conversation and distracting them from their work. This is probably a very familiar and established format, but it was new to me, and I was charmed, particularly by the way Boulet's answers were accomanied by gestures picked up by the camera and shown on the screen (I wasn't alone: one of the few audience questions was about his Lego watch). To the extent that there was a competitive element (boys: what can I say?) Boulet was the more outgoing of the two, and his bolder line meant that I could actually see what he was drawing, but I have every intention of following up both artists. 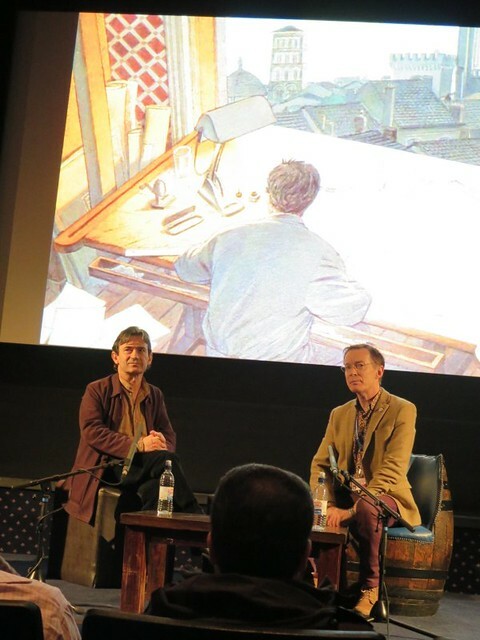 Just time for a breather, and then it was Bryan Talbot talking to Peter Kessler ('producer and writer, it says here, but more to the point, massive fan) about Luther Arkwright : a really good session, looking in detail at the book, picking out themes, influences, techniques. And at Luther Arkwright 's own influence, too. Who was it said about the Velvet Underground that only 200-odd people bought whichever record it was, but every one of those people went out and formed a band? Luther Arkwright 's early readership seems to be like that. After lunch, one last session, but the person I was most impressed to discover was at the festival: Benoît Peeters, scripter of the Cités Obscures series drawn by François Schuiten, which are about to start reappearing in English language editions. He was interviewed by Paul Gravett (and I'd been wondering why I hadn't seen Paul around the festival, so it was good to have a chance to say 'hello' to him). As we know, Paul knows everything about comics but haS no sense of timing, so we had a leisurely biographical ramble - actually, no complaints, as it filled in a lot I had not known about how closely Peeters and Schuiten work together, and the background to their shared interest in architecture. I'm not the greatest fan of the Cités Obscures - fabulous pictures, OK stories - but this canter through them showed me several I hadn't seen before, clearly I haven't been keeping up (and didn't see them in my recent forays into the bookshops of France), and yes, made me think I should probably give them another go. The way Peeters talked about "the architecture of the page" set off echoes about the book of his that I really do love, Case, Planche, Récit , the best book I've ever read about how comics work, at the level of the frame, the page and the whole narrative. Indeed it isn't. So that would be a local component on the menu, then. Good!